I bought my PC a couple of years back.Recently I upgraded to Windows 7, bought it off a local retailer. Recently my Windows 7 (build 7600 OEM) began to "troll" me in the most irritating way. The foremost thing I do after installing windows is enabling the Windows Update service from the Services Microsoft Service Console window. After that my system remains "safe" from the pirates; until recently when an astonishing behavior caught my eye as I saw Windows was constantly updating. I went back to check if things were right and saw that the Update service was running in Automatic(Delayed Start) mode. 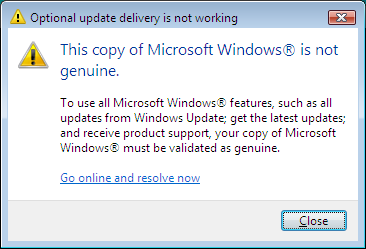 Today morning as I logged in I saw That Infamous watermark saying "This copy of windows is not genuine". After a brief online troubleshooting I came to know about a few tools to remove such watermarks and make the copy validated again. I downloaded one such tool (watermark remover). Though it did remove the watermark, the next session proved more irritating as "I became a victim of software counterfeiting" and pop-ups here and there notified me about going online to resolve the issue else windows services will be disabled. I came to know that the update KB971033 was the main culprit which silently injects a WAT(Windows Activation Tool) to detect for tampered activation files. I uninstalled the update but then the damage has been done. So i tried to restore my pc to a time before those updates were installed. After a successful rollback I logged on just to face the same problem again. I was shocked to know that the Windows Operating System that was bought by me was itself a pirated copy. The only thing I could do was to call the retailer up and get things straight. When I called them up they flatly denied their software was pirated. I showed them the papers and everything. They took me to a side and 'offered' me a 'compromise'. They told me about the 'compulsions' of operating in the software market, where piracy is a 'normal' thing. I remained firm and they, surprisingly returned around 80 percent of the money, and gave a Kaspersky Anti Virus to compensate for the rest.